I was introduced to a Thai dish recently, by my (Thai) friend Kathy, and now I am obsessed with it. 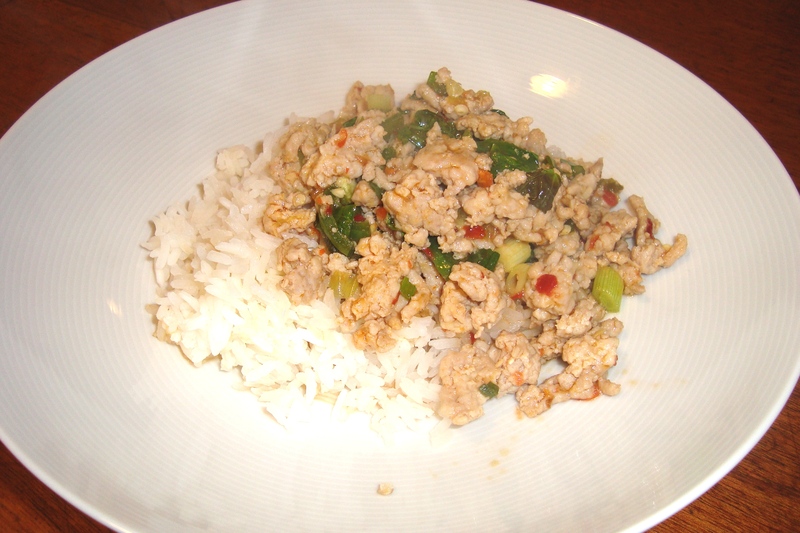 It’s ground chicken stir-fried with mint and chilies. It’s so simple but so good, and such a nice change from the old stand-bys pad thai, panang curry, etc. I decided to make a dish inspired by that using basil instead of mint. My version was a tiny bit salty, so I recommend starting with less fish sauce and adding more after tasting it. Heat a large skillet over high heat. Add the oil to the pan, and when it’s hot, add the garlic and fry until fragrant. Add the chicken, breaking up with a wooden spoon and allowing to brown. When the chicken is brown, add the green onions and jalapeno. Add the soy sauce, fish sauce, and chili sauce, then toss the meat around in the sauces. Finally, add the basil or mint and stir for about 30 seconds or until wilted.